Your accounting software has great importance in the functioning of your business. Microsoft Dynamics GP, otherwise known as Great Plains, is a highly recommended accounting and Enterprise resource planning software solution. It offers a simple way to manage the financials of your company, while effectively growing it through the use of software that is user-friendly and easy to manage. A majority of other technology, whether it’s email or phone apps, is swiftly moving to using clouds for the storage of its information. Businesses are quickly taking advantage of this trend and moving their ERP system to a hosted status. When your Microsoft Dynamics GP software is hosted, you and anyone else to whom you give access to the information will be able to access the information from anywhere at any time. Every company knows how frustrating downtime can be. When you host your ERP in the clouds, you will be guaranteed a working system around 99.5 percent of the time. Those statistics more than likely blow away your standard guarantee of up time. This allows you to greatly increase your company’s productivity and sales. When you host your Dynamics GP in the clouds, you eliminate the need for a dedicated IT employee who focuses solely on your ERP system. The hosting partner of your ERP will provide you with the support you need. This translates to more than 70 percent savings over choosing to host your ERP software on your own. In addition, you will greatly increase the productivity of your IT staff because you will eliminate the need for backups, updates and various other administrative tasks ERP systems require. 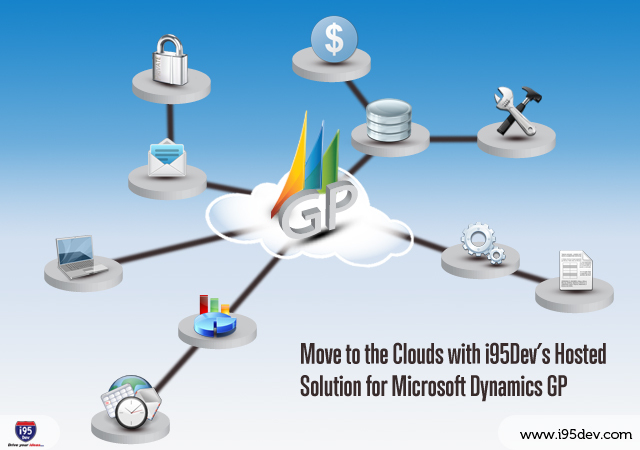 i95Dev is proud to announce the launch of its cloud for Dynamic GP. i95Dev’s cloud, known as Hosted GP, will help any mid-size business in its operations. We will handle all the administrative and technological tasks, enabling you to focus on your day-to-day operations. We maintain your database, productivity tools and email. We are excited to roll out this great solution, allowing you to get your business on track more quickly because hosted solutions give you faster deployment options than you would receive through on-premise hosting. Stay tuned for our next blog post, where we will break down exactly what i95Dev’s Cloud Dynamics GP can do for you, making it your next important business software solution decision.